(NaturalNews) What would your life be like if you didn't have a microwave oven? 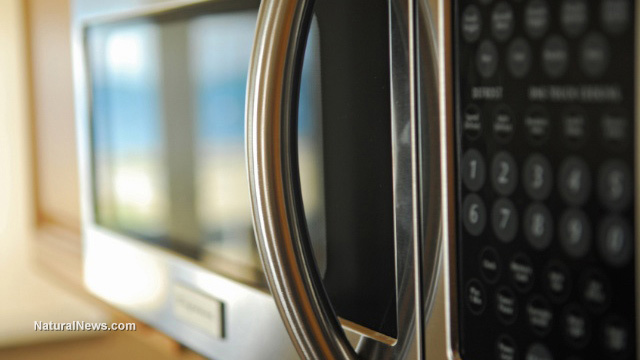 While your microwave certainly saves you time, is it slowly destroying your health? Not only do microwaves attract the most unhealthy, nutrient-depleted foods, but they also expose families to electromagnetic radiation that permeates the walls and the human body. The electromagnetic field (EMF) produced by common household microwaves is something Russia has taken seriously in the past. After conducting thorough research into the health effects of microwave EMFs, Russia determined in 1976 that microwaves were dangerous to their people. In that year, Russia banned the devices to protect their citizenry. The radio frequency radiation emitted by microwaves doesn't remain contained in the microwave oven. In fact, the FDA has their own set of safety standards limiting the amount of microwaves that can leak from an oven throughout its lifetime. In the U.S., any microwave that lets off over 5 milliwatts (mW) of microwave radiation per square centimeter up to 2 inches from the oven's surface is faulty and dangerous. In the real world, is this radiation really being measured from household to household? Most likely not, and consumers are led to believe that this new age cooking method is safe for their bodies. A handheld EMF meter can be used to test household microwave appliances for radio frequency radiation levels. When a microwave is turned on, its non-ionizing radiation can penetrate the walls and permeate the human body. In May 2011 the World Health Organization classified this EMF exposure as a class 2B possible carcinogen. Microwaves seem fast and simple, but how they prepare food is far from what the body would recognize as natural. When foods are cooked in microwaves the molecules are exposed to waves of energy that vibrate at the speed of 2.4 billion times per second; this causes the food molecules to resonate at very high frequencies. The food molecules quickly generate heat from the inside, where water is present. This cooking method is strikingly different from a convection oven, which emits a slow heat that warms the food from the outside-in. Microwave ovens, on the other hand, heat the food up from the inside-out, changing the very nature of the food, deforming the structures of the food molecules. This is why microwave food loses 60 to 90 percent of its nutritional value. In fact, the amino acids in milk and cereal grains break down into carcinogenic substances after they are put through a microwave. When meats are put through the microwave a carcinogen called d-Nitrosodienthanolamines forms. When fruits are exposed to microwaves, their glucoside and galactoside content breaks down into carcinogenic substances. When food is heated up in plastic containers, the chemicals from the plastic can heat up and leach into the food as well. Known carcinogens and endocrine disrupters such as BPA, phthalates, polyethylene terpthalate (PET), benzene, toluene and xylene can leech directly into microwave food. Berlin research dating back to 1942 investigated the health hazards associated with microwave food; this was the same research that led Russia to ban the devices in 1976. The ban was eventually lifted to promote free trade with the west; however, the problems with microwaves are still the same today. Russia ultimately issued an international warning for microwaves and cell phones, which release similar frequencies that cause biological and environmental hazards. The good news is that transitioning from a microwave to a convection oven is easy. Steamers or turbo ovens are great alternatives, too. It's much safer to let food defrost and allow it to cook naturally through convection, to avoid depleting the food's nutritional properties and changing its natural molecular chemistry. It's important to remember that food is information for the cells, and if the body no longer recognizes what is going in, then it cannot utilize nutrition that is no longer there.